In general, France is crazy about le football, that is soccer, but during the past few weeks we, and the rest of France, have become engaged by le rugby, the sport played with la ballon ovale (the oval ball). We watched several televised games in the Rugby World Cup tournament, paying attention to French and New Zealand teams as they advanced through the rounds to the final game. We had the amazing opportunity to spend the past weekend with two French families (more on that in a future post), and together we watched the Sunday morning finale de la coupe du monde de rugby (the rugby world cup final). Alas, the All Blacks of New Zealand beat Les Bleus (the blues) of France, 7-8. 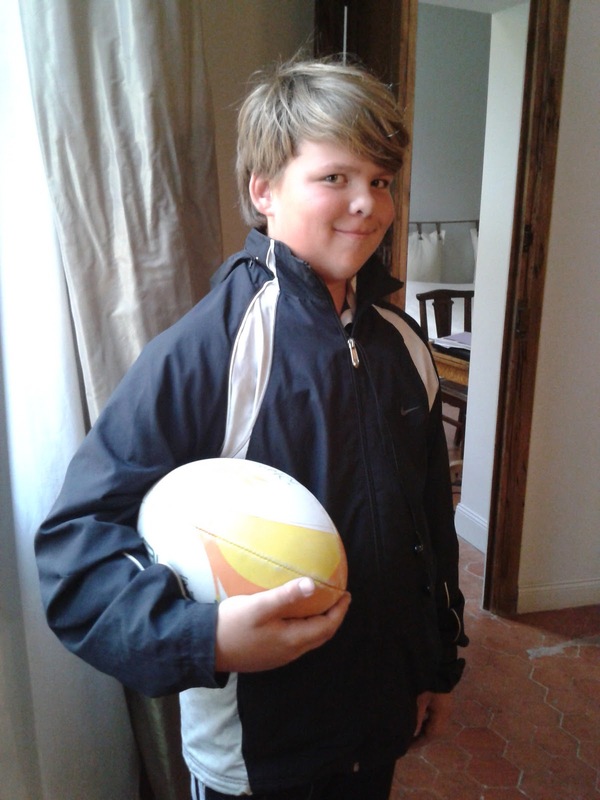 The team spirit of rugby is something that has made Jori feel really welcome on his rugby team as well. In an earlier post, I told how Jori was recruited by the AUC rugby club (Aix University Club) to join its U-13 rugby team, and he has spent the past 1 1/2 months training twice a week, taking the bus across town to the rugby field, first with me or one of his visiting grandparents, and now alone. Two weekends ago, his club hosted an afternoon tournoi (tournament) in which the teams played multiple short 10 minutes games. By the end of the tournament, Jori was deeply into the action, getting a few passes off, centering some scrums, and even getting tackled. We shrieked in glee, Il a la ballon! (He has the ball!). The French mothers who had been giving us kind smiles on the sidelines throughout laughed with us. Earlier, one of those women had approached us, apologizing in French that she'd like to talk with us but that she doesn't speak English. We were so thrilled by her friendly overture, babbling in French, pas de problème, parlez en francais s'il vous plait! (No problem, please speak in French!) We had a nice, if halting, conversation with her and learned that all the men and boys in her family seem to play rugby. And this past week, I walked Jori to the bus stop to wait for the bus with him, and one of his teammates approached and suddenly, my presence was unnecessary. Likewise, on Friday, we were enjoying an outdoor lunch in Aix, and another teammate walked past, exchanging excited hellos with Jori. We have really liked the camaraderie that the club and coaches foster among the boys and the families, including us despite the language barrier. We are looking forward to the upcoming team social events, where we hope to get to know more families. Very cool! Fergus would love to live somewhere he could learn to play cricket. It's interesting the things that culture embraces - and what we can learn from a culture embracing those things, too. Sounds like you are all having an interesting and enriching adventure. I'm living vicariously, so thanks for blogging! The boys seem to have found their new equilibrium! Isn't it amazing how quickly kids rise to the challenges of a new environment adapt to fit in?